This file photo provided by Microsoft shows the company's Surface Laptop, aimed at students. The Surface Laptop is the first Surface device without a detachable keyboard. Microsoft is taking aim at Google as it introduced a Surface device for students and slimmed down Windows for the classroom. 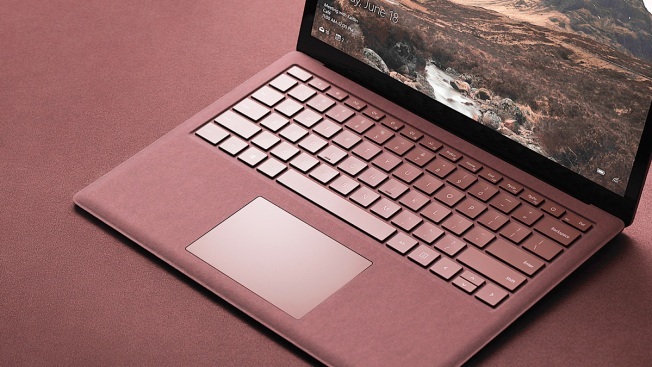 The new Surface Laptop is the first Surface device without a detachable keyboard. Microsoft says the new laptop will have up to 14.5 hours of battery life, compared with 12 hours for the MacBook Air. The Surface Laptop will come out on June 15. The laptop runs Windows 10 S, a streamlined version of the ubiquitous operating system. It will run only software downloaded from the Windows Store, a limitation that Microsoft touts as a security benefit. Microsoft's previous effort at a slimmed-down Windows, Windows RT, wasn't popular because it wouldn't run older programs unavailable in the Windows Store. The laptop comes at a rough time for the Surface line, which Microsoft blamed for the small revenue shortfall in its latest quarterly report. And it's a clear effort by Microsoft to step up competition with Google and its inexpensive Chromebooks in the classroom, where the latter has made major inroads . Microsoft said new education PCs running Windows 10 S will start at $189, a bit more than the cheapest Chromebooks. The Surface Laptop, though, will start at $999, the same as the MacBook Air. — Microsoft is adding a coding feature to Minecraft Education, the offshoot of its wildly popular creator game. Called "Code Builder," the feature combines Minecraft with learn-to-code tools such as Tynker and a new one from Microsoft called MakeCode. — A classroom version of Microsoft Teams will let students (supervised by their teacher) chat and work together online. In classroom group chats, students can listen to guest speakers, interact and even send emojis and GIF images. If it gets too rowdy, teachers can mute individual students or the whole class, or delete individual comments. Microsoft hopes the tool will serve as a digital hub for classrooms, where teachers can personalize learning and communicate with students and their parents.